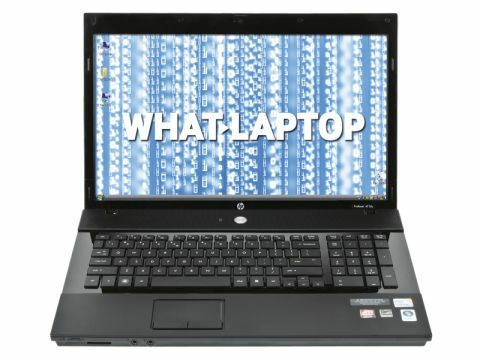 With austere styling and rugged build quality, the HP ProBook 4710s is aimed at the business market really. However, the extra rugged design makes it a great choice for clumsier students and home users, without compromising on features. The 17.3-inch screen features a matt TFT finish, which is fairly uncommon. As a result, reflections are well-contained, making it great for those wanting to study near windows or in brighter conditions. Colours look bright and accurate in isolation, but they look a lot more muted when compared to the excellent Acer Aspire 8930G. It's still a good panel for watching movies on, however, aided by the 16:9 widescreen aspect ratio and sharp 1600 x 900-pixel resolution. Although the screen falls slightly short of Full HD, Blu-ray movies still look pin-sharp and there's an HDMI port in place for outputting them to an external display. This laptop impresses when it comes to gaming and 3D performance. It's not as powerful as the Acer, but its ATI Mobility Radeon HD 4330 graphics card offers enough performance to play games and run graphic-intensive programs. The keyboard features a design where each key protrudes through an individual hole in the chassis (sometimes known as chiclet keys). There's more space between each key as a result, making it easier to type at speed without mistakes. It's a comfortable board, but it's also one of the noisiest, and there are no dedicated buttons for controlling your media files. The chassis features a mixture of gloss and matt plastics and, although it's a little conservative, it's a neat and tidy design. The shiny lid is a magnet for fingerprints, but is made from sturdy plastics and is up to the rigours of daily use. Everyday performance is excellent, thanks to a high-end 2.53GHz Intel Core 2 Duo processor and 3072MB of memory. The HP starts quickly and is capable of running several intensive applications with ease. An outstanding battery life of 324 minutes also means you'll be able to keep working during long trips out and about. There are far less ports than you'll find on the Acer, but the four USB ports still offer good connectivity. There's also a VGA port for connecting older monitors and projectors, as well as a 4-in-1 memory card reader and ExpressCard slot. 802.11n Wi-Fi and Bluetooth are both in place. While it lacks the full-on media credentials of the Acer or Sony's VAIO laptops, the HP ProBook 4710s remains a good choice for anyone who wants a machine as suited to a life on the road as it is in the home.